WGV… where we live… where we play. Other than a minor modification to the Master Development Plan (MDP) in April this year, Buc-ee’s has not taken any other steps in their plans to build their facility at the intersection of I 95 and International Golf Parkway. A number of us have attended virtually every Commissioners and Zoning Board Meeting this year strongly making our case that Buc-ee’s does not belong here and it presents a significant danger to our community, families, and children. Thank you to all who have attended and have spoken. Despite these efforts, we have been repeatedly reminded by the Commissioners and Zoning Board that there is nothing before their respective bodies on which they can vote. Further, I have observed that the media only provides coverage when there is a change in the status of the Buc-ee’s project. Therefore, I have come to the conclusion that continuing to speak at these meetings will not yield incremental value until Buc-ee’s takes the next step. We also run the risk of wearing out our welcome. I think we have already made all the points to be made so far. That being said, I am speaking for myself. This does not mean that you can’t continue to attend these meetings and express your opinions if you so choose. As a reminder, Commissioners Meetings are held every 1st and 3d Tuesday of the month at 9:00am and Zoning Board Meetings every 1st and 3d Thursday of the month at 1:30pm. 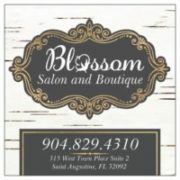 Both are held in the St. Johns County Auditorium located at 500 San Sebastian View, St. Augustine, Florida. It appears that the June 21, 2018 Zoning Board Meeting has been cancelled. Check the St. Johns County Website http://www.co.st-johns.fl.us before you go to be sure that the meeting has not been re-scheduled and to view the agenda. Asking for variance(s) to the P.U.D. Any of these will give us an opportunity to refresh our efforts and confront their requests with renewed vigor. Shannon Acevedo (the county planner in charge of reviewing the Buc-ee’s project) has done a really good job of keeping me and a number of other residents informed. She maintains a list of us and sends out emails with any changes Buc-ee’s makes. Secondly, there is an update section on the county website. In addition, I will monitor the Commissioners and Zoning Board meeting agendas. Should there be a relevant issue scheduled for presentation or discussion, I will let you know. I also read all the related postings on NextDoor.com. You’d be surprised at what some people post but sometimes there is useful information. Lastly, I have a Google Alert set up for Buc-ee’s that picks up items in the media. I feel pretty confident that with all of these, I can stay up to date and will continue to keep everyone posted. I encourage you all to follow these sources as well. This is a friendly reminder that there are two important meetings coming up. The St. Johns County Board of County Commission Meetings are held the first and third Tuesdays each month commencing at 9:00 am in the St. Johns County Auditorium located at 500 San Sebastian View, St. Augustine, FL. A public comments session is a standing agenda item at the beginning of each meeting whereby residents are afforded 3 minutes to address the Commissioners and express their opinions on relevant issues. Several of us will be speaking. Whether or not you choose to speak, your attendance showing your opposition to Buc-ee’s is valuable. Buc-ee’s is not a done deal. We are being heard and making progress. The more of us who attend, the more the County will have to listen. I and other concerned citizens will be at the entrance of the County Auditorium to direct you to the meeting location and answer any questions. The next Zoning Board meeting is Thursday, June 7, 2018. This Board is appointed by the Commissioners and will review and vote on any variances that Buc-ee’s requests before they are presented to the Commissioners. As such, it’s just as important that we make our case to them. The Zoning Board meets every first and third Thursday of the month at 1:30pm at the St. Johns County Auditorium located at 500 San Sebastian View, St. Augustine, FL. Similar to the Commissioners Meeting, this meeting is open to the public and there is a public comment session wherein concerns can be brought before the Zoning Board. I encourage all concerned residents to attend this meeting as well to show your opposition to Buc-ee’s. This by no means should alter our opposition to Buc-ee’s. They may be making these minor changes to appear that they are trying to be more compatible with the area. However, it’s like saying a 90 mega ton bomb is safer than a 100 mega ton bomb. Them caving a little doesn’t do it for me. It does mean that they are moving ahead so it is more important than ever that we band together and make our voices heard. The next Commissioners Meeting is at 9:00am May 15 and the next Zoning Board Meeting is at 1:30pm May 17. Both are held at the St. Johns County Auditorium located at 500 San Sebastian View, St. Augustine, FL. Remember, doing nothing is the best way for Buc-ee’s to win and all of us to lose. Show up. Join me ! Lance Williams 273 Pinehurst Pointe Drive St. Augustine, Florida. You are receiving this email, because you have shown interest in keeping up to date with the Buc-ees project within the World Commerce Center. Please note that we have received a Small Adjustment application to make some edits to the Master Development Plan (MDP) map which was recorded on 12/1/2017. Small Adjustment applications are handled similarly to Master Development Plan applications as they do not request any variances from the St Johns County Land Development Code or waivers from the approved World Commerce Center PUD ordinance. Any proposed change to an MDP Map can only be processed as a Small Adjustment if it meets the eligibility criteria of the Land Development Code as Small Adjustments do not require a public hearing. I have attached the application form and adjusted Master Development Plan map to this email for your information. Please note this is not an approved plan as it is still under staff review. § Even if you have written them before,do it again and again. Ifwe don’t, they’ll think we have given up. Silence means agreement. § Sign the online petition. Here’s the link:https://www.change.org/p/st-johns-county-commissioners-the-world-golf-community-does-not-want-buc-ee-s-convenience-storeOver 2,000have signed the petition but we need more. § We are being heard and making progress butwemust keep up the pressure byattendingtheCountyCommissionersand Planning and Zoning BoardMeetings. The more of us who attend, the more the County will have to listen. § The St. Johns County Board of County Commission Meetings are held the first and third Tuesdays each month commencing at 9:00 amin the St. Johns County Auditorium located at 500 San Sebastian View, St. Augustine, FL. § A public comments session is a standing agenda item at the beginning of each meeting whereby residents are afforded 3 minutes to address the Commissioners and express their opinions on relevant issues. Several of us will be speaking. Whether or not you choose to speak, your attendance showing your opposition to Buc-ee’s is valuable. § I and other concerned citizens will be at the entrance of theCountyAuditoriumto direct you to the meeting location and answer any questions. • The next Zoning Board meeting isThursday,May 3, 2018at1:30pm. This Board is appointed by the Commissioners and will review and vote on any variances that Buc-ee’s requests before they are presented to the Commissioners. As such, it’s just as important that we make our case to them. § The Zoning Board meets every first and third Thursday of the month at 1:30pmat the St. Johns County Auditorium located at 500 San Sebastian View, St. Augustine, FL. § Similar to the Commissioners Meeting, this meeting is open to the public and there is a public comment session wherein concerns can be brought before the Zoning Board. I encourage all concerned residents to attend this meeting as well to show your opposition to Buc-ee’s. § ? The St. Johns County Board of County Commission Meetings are held the first and third Tuesdays each month commencing at 9:00 am in the St. Johns County Auditorium located at 500 San Sebastian View, St. Augustine, FL. § ? A public comments session is a standing agenda item at the beginning of each meeting whereby residents are afforded 3 minutes to address the Commissioners and express their opinions on relevant issues. Several of us will be speaking. Whether or not you choose to speak, your attendance showing your opposition to Buc-ee’s is valuable. Buc-ee’s is not a done deal. We are being heard and making progress. The more of us who attend, the more the County will have to listen. § ? I and other concerned citizens will be at the entrance of the County Auditorium to direct you to the meeting location and answer any questions. • The next Zoning Board meeting is Thursday, April19, 2018. This Board is appointed by the Commissioners and will review and vote on any variances that Buc-ee’s requests before they are presented to the Commissioners. As such, it’s just as important that we make our case to them. § ? The Zoning Board meets every first and third Thursday of the month at 1:30pm at the St. Johns County Auditorium located at 500 San Sebastian View, St. Augustine, FL. § ? Similar to the Commissioners Meeting, this meeting is open to the public and there is a public comment session wherein concerns can be brought before the Zoning Board. I encourage all concerned residents to attend this meeting as well to show your opposition to Buc-ee’s. Sign the on line petition. Click on the following link: https://www.change.org/p/st-johns-county-commissioners-the-world-golf-community-does-not-want-buc-ee-s-convenience-store and join the over 2,000 residents who are against the Buc-ee’s facility in our community and have already signed the petition. 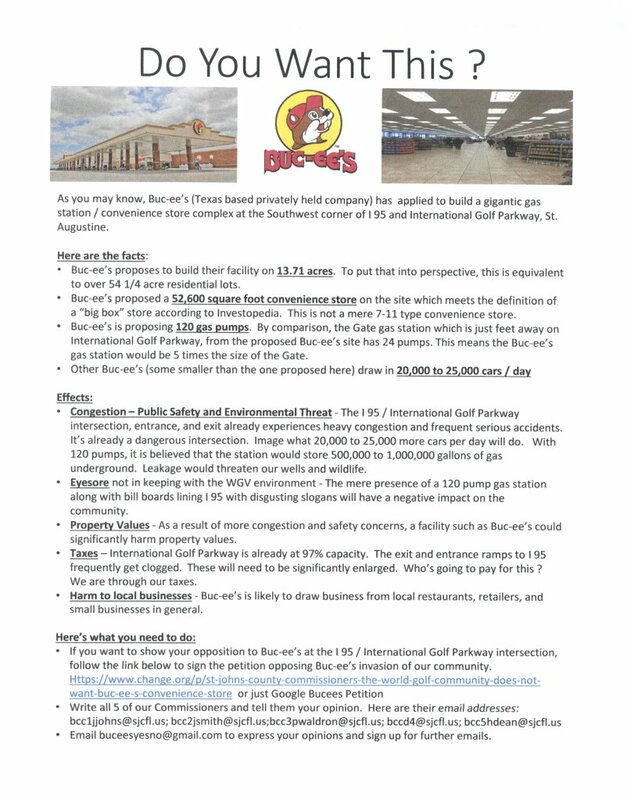 Buc’ee’s: Some of our neighbors have been working to gather info about Buc-ee’s to provide you with information pertaining to the new proposed Buc-ee’s coming the exit of International Golf Parkway / World Golf Village. See jpeg below. and provided a link to a petition. Click here if you would like to sign it. Keep in mind that there are also neighbors who feel this could be an asset to our area. I am keeping neutral, just trying to help get the word out so folks can make a decision for their own sake.